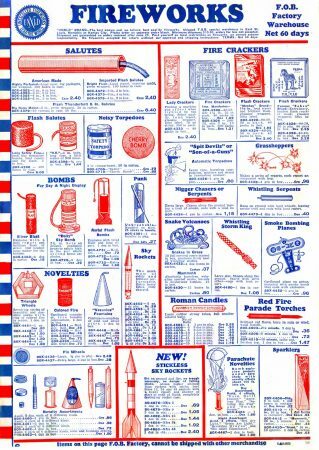 Here’s a page of Fireworks – firecrackers, roman candles, fountains and more – enough to ignite the imagination of any red-blooded American boy from 82 summers ago who dreamed of the fun to be had on the Fourth of July. 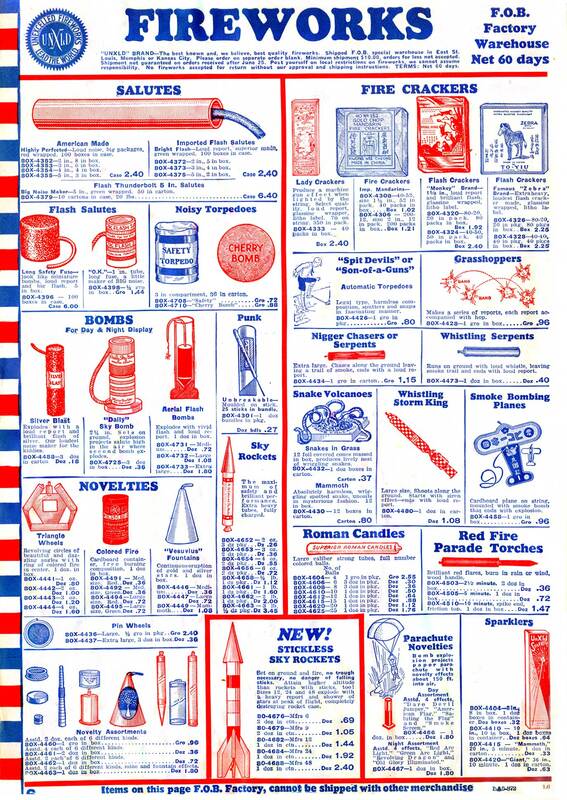 Independence Day is a reminder of the freedom granted to all Americans by the very invention of this nation, celebrated here on white pages sparkling with red and blue ink. Which makes the casual racism sitting in plain sight on this page all the more disturbing. It’s not big or overt; I won’t point it out. You’ll have to zoom in and find it, and once seen it can’t be unseen. It’s sad to consider. America independence means liberty and justice, freedom and equality for all…except whenever it doesn’t. Which unfortunately has been too often the case. Even in America it seems like someone always seems to be considered “less equal” than others. It’s a lesson this country has been forced to learn and re-learn, even into the 21st century. Just something to think about as you light up that sparkler this 4th of July: revolutions and prejudice must continue to be fought. Next Next post: Scouts…or Stews?